well not really in Florida... even though its been Fall for a month now. It's hard living in Florida to really get into the fall spirit with temperatures in the mid 80's, the sun beaming down and the trees still green. It is not until the end of October with Halloween around the corner, pumpkins carved on doorsteps, and a brisk cool breeze every now and again that it starts to really feel like the Fall season. 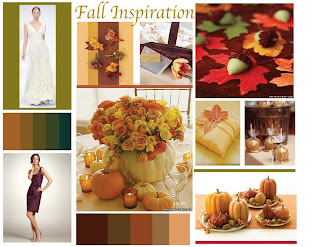 For those brides with a Fall inspired wedding, here is an inspiration board to get you into the spirit. Check back at the end of the week to see the Fall inspired pieces we create.